The crockpot can come to the rescue for slowly braising meat all day, so you have only minimal meal preparation when you come home from work. Slow cooking is a time-honored method of turning tougher cuts of meat into succulent, tender, juicy delights. Time, salt, heat, and liquid act together to release all of the flavors of the meat. Aromatics such as onions and umami-infusing ingredients such as mushrooms complete the flavor development. You have some options with this recipe. Adding a cup of wine will develop more flavor, but it is acceptable to leave it out. You can use regular or low salt beef bouillon as you desire. The Tabasco sauce adds a little kick, and you can add a much as 1 1/2 teaspoons if you like to really pump up the spice level. This recipe calls for plain, white cooked rice, but you can choose whether you prefer long grain rice or short grain rice. Brown rice or wild rice are additional options. 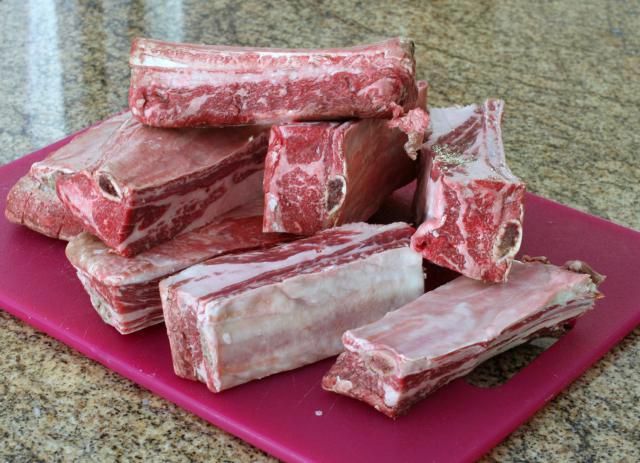 Short ribs comprise several different cuts from the brisket, chuck, or rib area. Chuck short ribs are meatier but tougher and benefit from the long braising time in the slow cooker. Heat a skillet with the oil and brown the short ribs on all sides. Place all ingredients except the rice in an electric slow cooker. Mix them well. Cover and cook the short ribs on low for 8 to 10 hours or on high for 5 hours. Cook the rice by stovetop method or in a rice cooker. Serve the short ribs hot with the cooked rice on the side. With the short ribs and rice, you have the protein and starch portions of the meal. The juices from the meat make a good drizzle on the rice. If desired, you can cook them on high for a few minutes to concentrate them. Now you can be creative in deciding which vegetables to serve to round out the meal. Starting with a leafy green salad can give a good fresh component that takes only a couple of minutes to prepare. Adding a side of steamed vegetables is also a quick and easy accompaniment.